The last time I blogged it was to introduce an exciting project which we’d teamed up with our local Scouting group to organise. After many weeks of preparation, and lots of hard work by the whole team, on Sunday 13th May it was the day for the inaugural #ShifnalScoutingCycleChallenge. The routes had been planned; a feed station organised en route, and the catering arrangements made. All we needed now was some good weather, and some cyclists wanting to take on the Challenge. 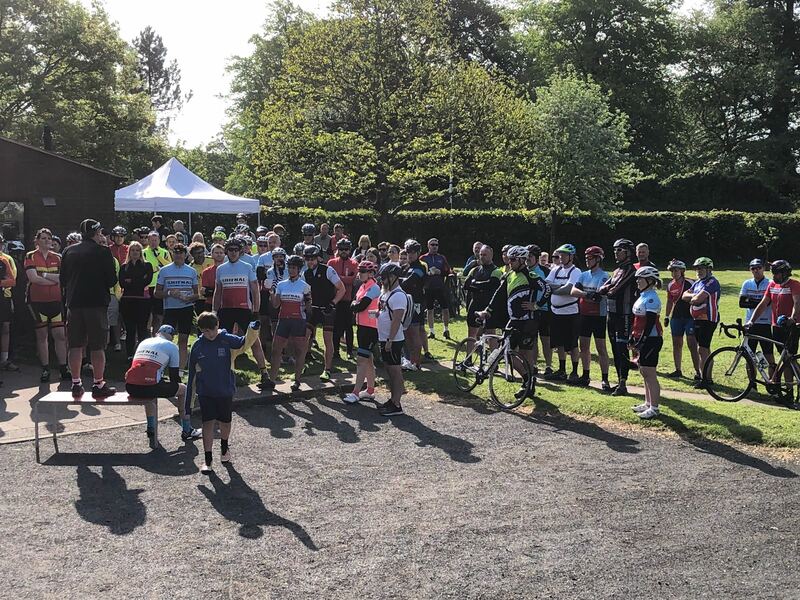 Registration for the event opened at 0800, and with the sun shining and temperature rising, a steady stream of cyclists started to arrive. In no time at all, bikes were seemingly everywhere, and the atmosphere was great as the riders enjoyed a pre ride coffee, and bacon sandwich. Complimenting the online entrants, were a number of people entering on the day. Taking a moment to look around the Scout hut, it was amazing to see the level of support we’d received. After a quick rider briefing, the start was opened just after 0900, and the riders began to roll away from the start. The start area emptied quickly, and it was soon just Gary and I left to leave. We were to act as the joint ‘Lantern Rouge’ for the event, sweeping up any problems along the way. Fortunately, our services weren’t required. We arrived at the feed station in Gnosall (a massive thanks to Gnosall Scouting for letting us use their hut on the day) to the sight of cyclists enjoying hard earned coffee and cake, most of which had been handmade by the various groups which form the Shifnal Scouting family. Even at this relatively early point in the day, the feedback was positive, and without exception, every rider was enjoying the challenge. Gary and I were joined by Len at the feed station, and we spent the next hour and half of so riding round the outer loop of the event. Conditions were just about perfect; a lovely early summer day. A quick 2nd stop at the feed station, more positive feedback received, and we’d already had reports of the many of the 50km riders returning to the event HQ. The glorious weather continued and in seemingly no time at all, we were rolling back into Shifnal. On arrival it was great to see so many riders still enjoying the post ride refreshments in the sun. The mood was upbeat to say the least, and people were exchanging experiences and stories from the day’s ride. Over a burger and coffee it was great to be able to catch up with so many of the riders who’d all played their own part in making the event such a resounding success. I’d like to sign off by thanking everyone involved in the challenge for playing their part in making it such a fantastic day. We raised over £1600 on the day, and you can all rest assured that every penny of money raised will go towards the building of the new bushcraft shelter for the group, which we’re hoping to start work on in the coming months.